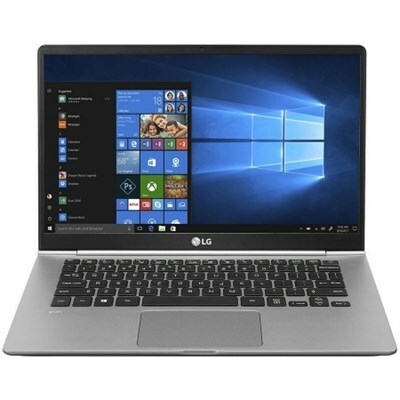 The updated LG gram arrives with a 14" 1080p IPS touchscreen display and improved 72Wh battery with up to 17.5 hours of battery life, in a laptop that weighs just over 2 pounds. Enjoy premium performance from the 8th generation Intel Core i7 processor, durable metal alloy construction and the many connectivity options, including USB Type-C. MobileMark 2014 standard (MobileMark is a trademark of the Business Applications Performance Corporation). Performance level is utilized for comparison purposes only, and does not necessarily reflect the battery life that will be achieved. Actual battery life will vary from specifications depending on model, setup configuration, applications used, features utilized and power management settings. Dimensions (WxHxD): 12.7" x 8.3" x 0.6"
Shipping Dimensions (WxHxD): 17.1" x 10.2" x 2.4"